Almond milk is made from ground almonds, and people often prefer it to cow's milk because of its lower fat, saturated fat and cholesterol content. 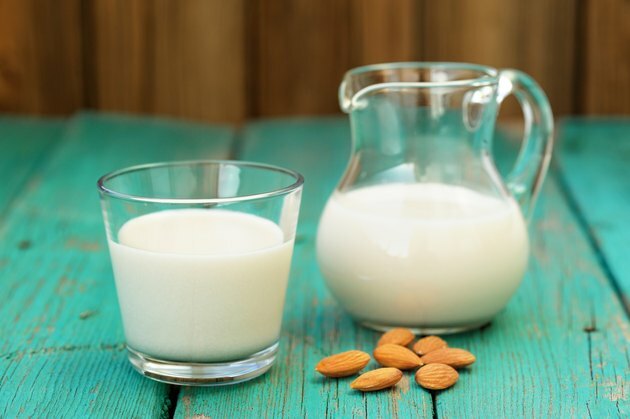 Almond milk is often free of lactose, the natural sugar found in milk products that results in digestive problems for a number of individuals. Almond milk is rich in nutritional value including carbohydrates. Sweetened almond milk contains added sugars that further contribute to its carbohydrate content. A 1-cup serving of almond milk contains 8 grams of carbohydrates. Carbohydrates are macronutrients -- nutrients the body needs in the largest quantities to support its energy needs. About 45 to 65 percent of your total caloric intake should come from carbohydrates. A 1-cup serving of almond milk supplies about 3 percent of the recommended intake of carbohydrates, based on a 2,000-calorie diet. Of the 8 grams of carbohydrates in a serving of almond milk, 1 gram exists in the form of dietary fiber. Fiber is a carbohydrate exclusive to plant products, and serves a number of important functions in the diet. According to the Harvard School of Public Health, fiber can help improve cardiovascular health, reduce the risk of type 2 diabetes and improve digestion. Adult women and men need about 26 and 38 grams of fiber each day, respectively. A serving of almond milk provides about 3 to 4 percent the typical adult's daily fiber needs. Sugars are simple carbohydrates, consisting of either 1 or 2 saccharide molecules. These simple carbohydrates are quickly digested and converted to glucose, which the body uses for cellular energy. Of the 8 grams of carbohydrates in a serving of almond milk, 7 grams exist in the form of sugar. A similar-sized serving of flavored almond milk contains about twice the amount of sugar. While most nutrition labels do not distinguish carbohydrate content beyond total carbohydrates, fiber and sugar, the USDA provides nutrition for raw ground almonds, which likely resembles the type, if not the value, of sugars in almond milk. A 1-cup serving of ground almonds contains 3.72 grams of sugar. Of these 3.72 grams, 3.42 grams and 0.04 grams exist in the form of the disaccharides sucrose and maltose, respectively, while 0.11 grams, 0.09 grams and 0.05 grams come from the monosaccharides glucose, fructose and galactose, respectively. A 1-cup serving of almonds contains 0.7 grams of starch, a plant-derived polysaccharide composed of hundreds of molecules of glucose. Do Almonds Cause Stomach Cramps?